This gentle and refined scallop dish is more of a ceviche than a tartare. With a tartare, the meat or fish is completely raw, but with a ceviche it is ‘cooked’ – effectively – by the acidity of the citrus juice. Here, the scallop sits in the lemon juice, but only for about 10 minutes, which I think is more than enough. 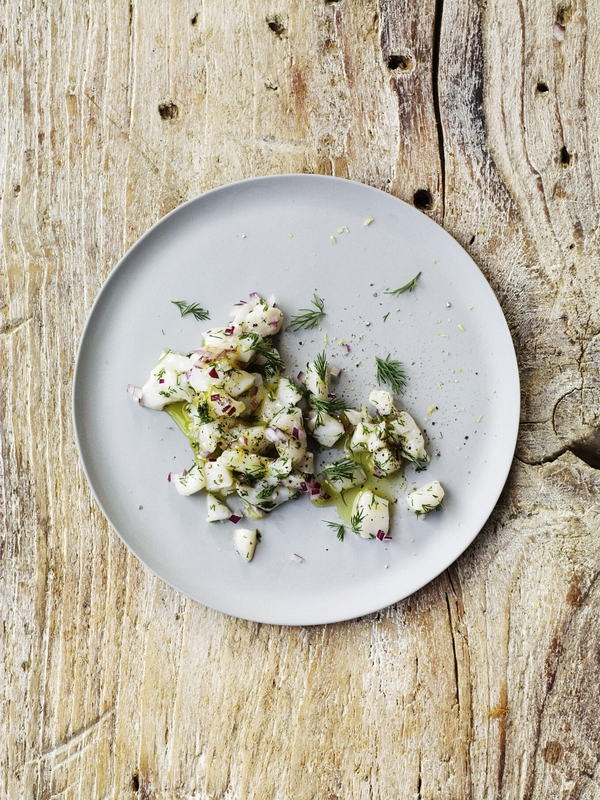 The recipe has a slight Scandinavian feel to it, which takes it into new territory – as far as ceviche goes anyway. Make sure your scallops are super-fresh for this dish. I tend to buy live ones, in the shell, then cut and prepare them myself. However, your fishmonger will happily do this for you, if you prefer. To do it yourself, take a thin-bladed knife, such as a filleting knife, and hold the shell upright, with the rounded edge downward on the board and the hinge at the top. If you’re right-handed, the flat side of the shell should face to your right (and to your left, if you’re left handed). Find an opening as near to the top edge of the shell as possible and ease in the knife tip. Keep the knife as tight to the flat of the shell as possible and cut down through the muscle at the point it meets the shell. This will allow you to open the scallop. Run the tip of the knife under the scallop and lift it out of the lower part of the shell onto a board. Remove the orange-coloured roe, the translucent strip of frill and the black gut sack at the back of the muscle. Peel away the very fine membrane that runs around the scallop’s edge so that you’re left with pure white muscle. Save the roe for frying off separately and freeze the frills for fish stock (they have a lot of flavour). Repeat for all the scallops. Dice the scallop meat into large pea-sized pieces and combine with the lemon juice and zest, and the diced red onion, chopped dill and olive oil. Season with a little salt and pepper and turn gently together. Let the scallops sit in the lemon for 10 minutes, then serve straight away with a scattering of the reserved dill and the juices from the bowl.